1/1, 1897-May 1904. 5 francs a year/ 10-14 pp. The cover depicts a young woman clad in a robe holding her hand toward a rayed sun with the word (in Greek) "Eros" printed on it, surrounded by a triangle. Noted in Banner of Light, 1898 and 1899 and in L'Au-Dela, January 1905. 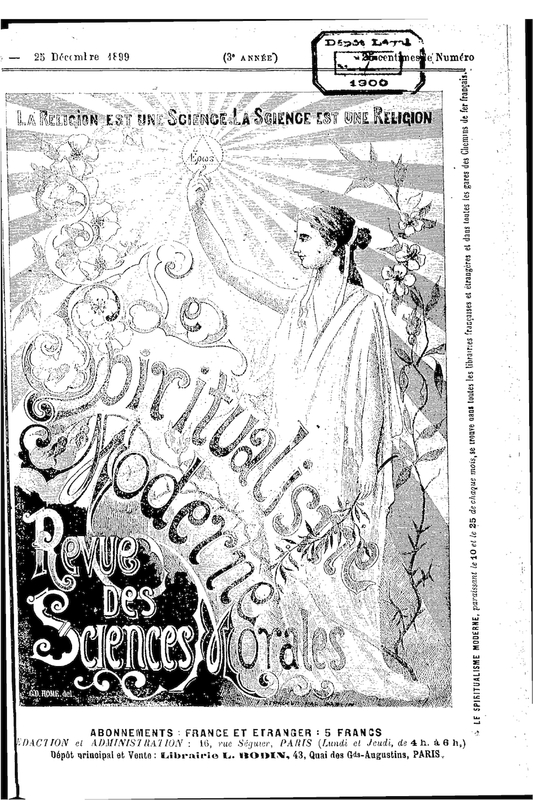 Beaudelot was a spiritualist (he took part in the Congres Spirite et Spiritualiste International in 1889), but also moved in the circle of occultists around Papus, who wrote in his journals and later published through his Librairie A.M. Beaudelot in Paris. Although the journal carried occasional articles by others on the photography of psychic rays, D.D. Home, and human magnetic fluid, most of the journal consisted of Baudelot's abstract and moralistic thoughts on envy, ignorance, renewal, the law of love, education, sincerity, the influence of spiritualism on art and and culture, and the like. Contributions by Leon Denis, Albert Jounet, "Quaestor Vitae," and others. BNF, microfilm.